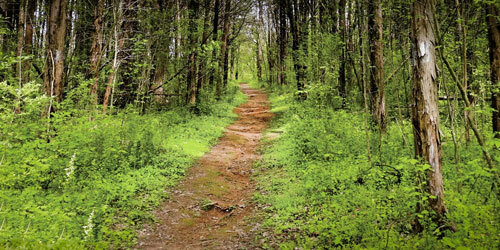 There are several parks and community points of interest in Pigeon Forge, Gatlinburg, and the surrounding areas. Whether you're looking to get some exercise with a nice walk along the river, to find a playground your children can enjoy, or to attend a festival at Patriot Park, you'll find these facilities can accomodate a variety of locals and travelers alike. The park is a large open space ideal for festivals. A walking trail lined with flagpoles featuring flags from all 50 states surrounds the park, which also features an historic missile, a large model of the Liberty Bell, and Winterfest displays. Adjacent to Patriot Park is the historic Old Mill built in 1830. A pavillion with 14 picnic tables and four electrical outlets may be reserved by calling 865-429-7373. A large gazebo overlooking the Little Pigeon River may also be reserved. Call 865-429-7373 for details. Patriot Park is also the central hub of the Fun Time Trolley. Wear Farm City Park, located at 623 Wears Valley Road, is a brand new 118 acre zone to replace the former park entitled “City Park.” This beautiful space is a great multi-purpose area that is equipped with pavilions, playgrounds, ball fields and more. From sports teams to family reunions, large groups are delighted to enjoy this spacious and well-equipped park. Reservations are required for most large events and activities. Please consult the Pigeon Forge Department of Parks and Recreation at (865) 429-7373. This 86,000 square foot facility includes basketball and racquetball courts as well as a 5,000 square foot fitness center and indoor jogging circuit. The center is home to both an indoor and outdoor pool, and also a bowling center. 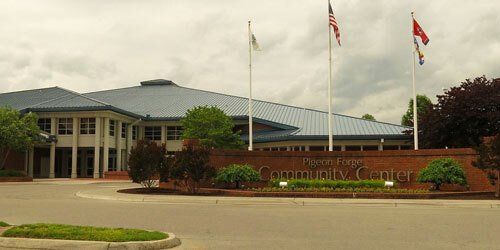 Childcare is available for guests of the Pigeon Forge Community Center. For more information, contact the Pigeon Forge Department of Parks and Recreation. 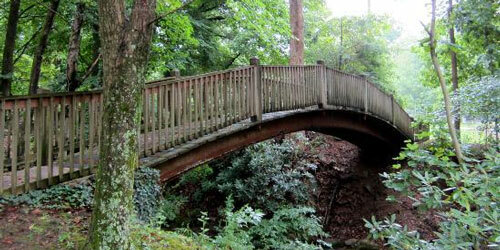 Mills Park is a large park convenient to the East Parkway in Gatlinburg. It is accessed from U.S. 321 at stoplight number 3 to Mills Park Road. The park features a pavilion with public restrooms and a fireplace. The pavilion may be reserved by calling the Gatlinburg Community Center at (865) 436-4990. Mills Park also features two children's play areas, a basketball court, soccer field, and 400 meter track. 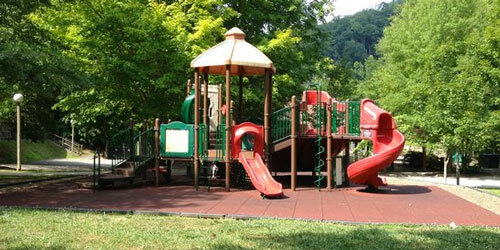 Mills park is within walking distance of the Gatlinburg Community Center. Mynatt Park is centrally located in Gatlinburg. It is situated just outside of the National Park boundary. This streamside park is one of Gatlinburg's designated Children's Fishing Areas. No individual over 12 years of age is permitted to fish at Mynatt Park. Amenities at Mynatt Park include a covered Pavillion with public restrooms, numerous picnic tables and grills, basketball and tennis courts, a basevall fields, and a playground area for children. Mynatt Park is located on Asbury Lane in Gatlinburg. Herbert Holt Park, formerly known as North Gatlinburg Park, is a quiet park on the banks of the West Prong of the Little Pigeon River. The park features a covered pavillion with public restrooms. This riverside park is also a designated Children's Fishing Area for children under 12 years of age. The park features picnic tables and grills as well as a children's playground. This park is also unique in that it is home to Gatlinburg's trout fish facility which rears trout for release into local waters. The Gatlinburg Community Center features an indoor swimming pool, a bowling center, tennis and racquetball courts, a fitness center, and a skate park for skateboards and other skate equipment. Call (865) 436-4990 for park pavillion reservations. The memorial river trail greenway is a riverside park featuring a walking trail along the water's edge. 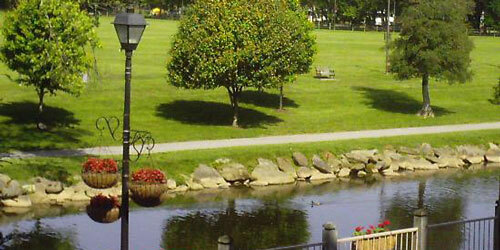 The beautifully landscaped greenway adjoins the Paine Memorial Park with picnic tables and a gazebo. Benches line the walking trail for enjoyment of the scenery along the river, which includes numerous migratory birds and other waterfowl. The greenway passes the McMahan Burial Mound in Sevierville before continuing on a boardwalk to the Great Smoky Mountains Parkway Bridge over the Little Pigeon River in Sevierville. At the bridge, the greenway continues to Sevierville City Park through a forested area and across a small covered bridge. You can see the brochure here. Sevierville City Park also features pavilions with public restrooms. Picnic tables and grills in a wooded area adjacent to a river are ideal for cookouts. Soccer and baseball fields as well as basketball and tennis courts are available. To reserve a pavillion, call (865) 453-5441. 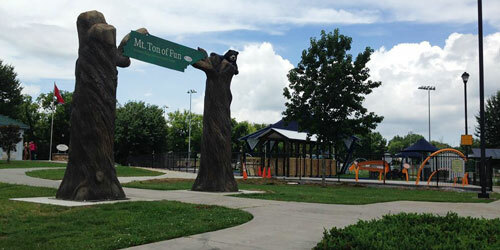 The Sevierville City Park is also home to the Mt. Ton of Fun children's playground and the Unleashed Dog Park. The Mt. Ton of Fun Inclusive Playground opened in July of 2017, and it has something for everyone. Play equipment addresses all five development domains: physical, social-emotional, sensory, and cognitive and communicative. It's located at 1005 Park Road in Sevierville. Find more information through the Sevierville Community Center and read the brochure here. 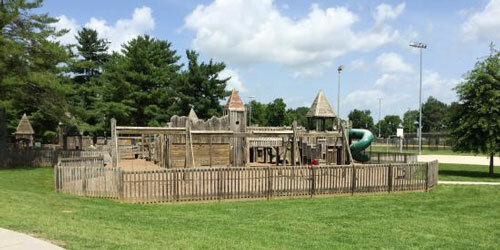 The large playground is not the average playground; it is a 20,000 square foot wooden adventure zone! It features nets to climb on, a treehouse, space ship, slides, and a climbing wall as well as less exotic play equipment like swings and monkeybars. The entire playground is fenced in for the safety of all children. Since its opening in 2017, Sevierville’s Unleashed Dog Park was designed to give dogs a safe space to run and enjoy the outdoors. The park features separate areas for small and large breeds, agility equipment, water, shaded benches, double fence entry, and WiFi. Located within the Sevierville City Park, the dog park is open all year round. This park was created in 1976 to celebrate America's Bicentennial celebration. The park allows visitors to pay respects to the honored dead of Sevier County, many of whom were veterans of the Revolutionary War and the War of 1812. This park is the final resting place for many of Sevier County's founding leaders. The park features a walking trail and a seating area with benches overlooking the Little Pigeon River. The Sevierville Community center features bowling, racquetball, basketball, an indoor swimming pool, and a fitness center for aerobic and weight training. For more information about the Sevierville Community Center, contact the Sevierville Parks and Recreation Department at 453-5441. 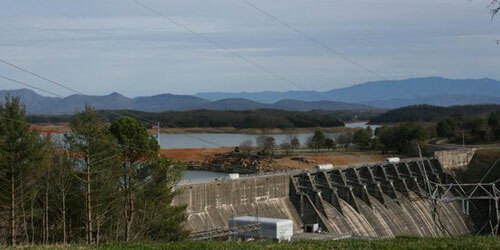 The Douglas Reservoir Picnic area features public restrooms and views of Douglas Lake and The Great Smoky Mountains. Picnic tables and grills are plentiful. 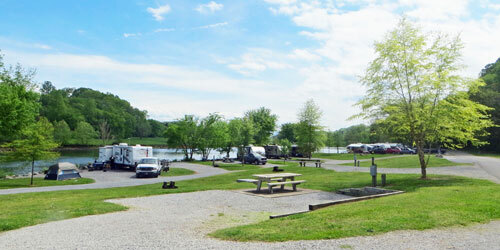 This campground features 65 campsites, 61 with water and electric hookup and two handicapped-accessible sites. 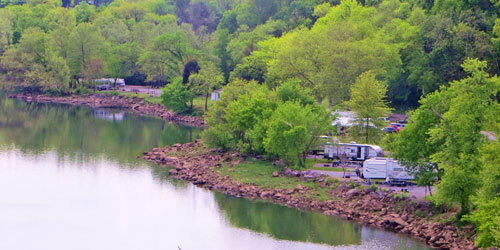 Located at the tail end of Douglas Dam, the tailwater campgrounds feature 61 campsites, 45 with water and electric hookup and 2 handicap accessible sites. The area includes 7 tent only campsites and 9 RV sites, as well as 2 bathhouses with showers and toilets. This Wild Area features walking trails through 30 acres of mature hardwood forest, limestone sinkholes, spring wildflowers, and vistas of the dam and tailwaters. This is a self-service campground. Recreation opportunities: 64 campsites, 30 with water and electric hookup and two handicapped-accessible sites. Rest rooms with heated showers and flush toilets, children’s play equipment, picnic tables and grills, group pavilion available by reservation, boat ramp, river fishing with fishing pier, bait and tackle shop, wildlife viewing area, bird-watching. The upper overlook boasts a commanding view of the Great Smoky Mountains and Douglas Reservoir. The lower overlook has a good view of Douglas Dam and the French Broad River basin. Both are accessed from Highway 338, follow the posted signs.